Contributed to MSBL by Steve Spielman and Sandy Weissent It was two months after the greatest first baseman in the history of the game had learned he had a fatal disease. The speech the Iron Horse delivered that day has been called “Baseball’s Gettysburg Address.” Lou Gehrig almost didn’t give the speech. During the ceremony, Gehrig’s current teammates, members of the legendary 1927 Yankees, and the visiting Senator players fanned out around the infield There were several speeches, including those from such dignitaries as New York Mayor Fiorello LaGuardia, Yankee manager Joe McCarthy, and Babe Ruth. But only one speech would be remembered. Several gifts were bestowed upon “Larrapin’ Lou” including an expensive fishing rod and reel from his teammates, a silver platter from the stadium vendors, and silver candlesticks from crosstown rivals, the New York Giants. Gehrig was presented several trophies. At one point, Lou, in his weakened state, staggered when he was unable to hold a particularly heavy trophy and was assisted by a few teammates in setting it on the ground. When the time came for Gehrig to give his remarks, the naturally shy man broke down. Unable to approach the microphones, he just stared at the ground before pulling a handkerchief from his pocket to dab his eyes. The 61,000 fans jammed into the stadium began chanting: “We want Lou! We want Lou!” Sportswriter Sam Mercer, serving as the event’s master of ceremonies, stepped to the microphones and informed the fans that Gehrig was too moved to speak. Mercer thanked the crowd over the din of the thunderous chanting. McCarthy then put his hand around Gehrig’s shoulders and whispered something into his ear. Lou nodded, stepped up to the microphones, and took a deep breath.The crowd fell silent. No doubt, more than 82,000 teary eyes were looking at home plate. Only a small snippet of newsreel footage of the ceremony exists, about three sentences of Lou’s speech (fortunately one being the most powerful). But it is enough to give you an idea of how it would have been to be in Yankee Stadium that day and hear Gehrig’s words with that distinctive echo effect. Sportswriters jotted down every word of the speech, so we know what he said. In less than a year after delivering this speech, Lou was dead at the age of 37 What is found interesting are the differences between Lou’s actual speech and the one presented in the movie Pride of the Yankees. Lou’s wife Eleanor was paid $30,000 for the rights to her husband’s story. She implored the movie higher-ups to use the exact words that Lou had used. Most personnel working on the film agreed with her but the two most influential ones did not, and changes were made. Eleanor Gehrig had told producer Sam Goldwyn, “I feel if you should depart from the original, you will lose all of the simple charm (of Lou).” The movie mogul disagreed, as well as director Sam Wood, and changes to the speech were made. It is understandable that the movie version of the speech would be shorter, both for dramatic effect and time limitations. 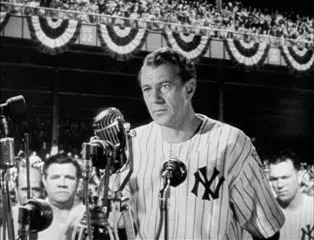 The most famous line of Lou’s speech—”I consider myself the luckiest man on the face of the Earth”—was moved to the end of the address in the movie rather than at the beginning as Gehrig originally had it. This was likely a good choice, making it more dramatic. Another change was Lou’s original line, “I have been in ballparks for 17 years” being changed to “I have been walking onto ball fields for 16 years.” This was an odd change because not only is it neither more dramatic nor more concise, it is inaccurate. Lou performed in the major leagues for 17 years, not 16. As for the other changes, it is it up to the reader to determine if they were for the better. Both versions, the original and the movie, are presented below for comparison purposes. “Fans, for the past two weeks you have been reading about the bad break I got. Yet today I consider myself the luckiest man on the face of this earth. I have been in ballparks for 17 years and have never received anything but kindness and encouragement from you fans. Look at these grand men. Which of you wouldn’t consider it the highlight of his career just to associate with them for even one day? Who wouldn’t consider it an honor to have known Jacob Ruppert? Also, the builder of baseball’s greatest empire, Ed Barrow? To have spent six years with that wonderful little fellow, Miller Huggins? Then to have spent the next nine years with that outstanding leader, that smart student of psychology, the best manager in baseball today, Joe McCarthy? When the New York Giants, a team you would give your right arm to beat, and vice versa, sends you a gift—that’s something. When everybody down to the groundskeepers and those boys in white coats [the vendors] remember you with trophies—that’s something. When you have a wonderful mother-in-law, who takes sides with you in squabbles with her own daughter—that’s something. When you have a father and a mother who work all their lives so you can have an education and build your body—it’s a blessing. When you have a wife, who has been a tower of strength and shown more courage than you dreamed existed—that’s the finest I know. “I have been walking onto ball fields for 16 years, and I’ve never received anything but kindness and encouragement from you fans. I have had the great honor to have played with these great veteran ballplayers on my left—Murderers’ Row, our championship team of 1927. I have had the further honor living and playing with these men on my right—the Bronx Bombers, the Yankees of today. I have been given fame and undeserved praise by the boys up there behind the wire, my friends, the sportswriters. I have worked under the two greatest managers of all time, Miller Huggins and Joe McCarthy. I have a mother and father who fought to give me health and a solid background in my youth. I have a wife, a companion for life, who has shown me more courage than I ever knew.